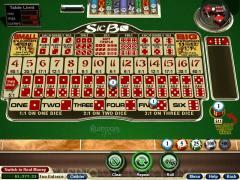 Sic Bo is an Asian game that is very popular in both land and online casinos. The screen layout is very convenient. The dice outcomes are shown in the top right corner. The large betting area covers the central portion of the screen. The past outcomes of the Big and Small bets are tracked in the top left hand corner. These are very popular bets. 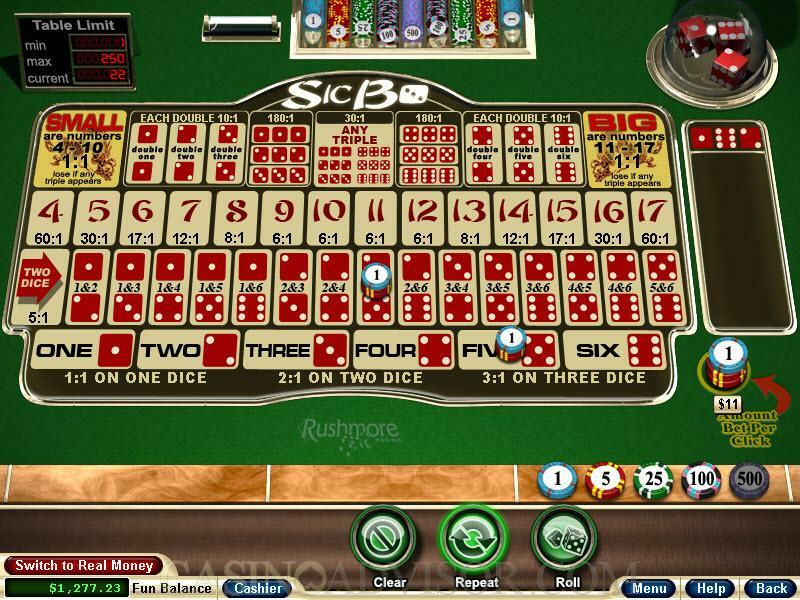 Sic Bo is played with three dice. Players can either bet on the total of the three dice or on the combination of the numbers. The bets in the central layer of the betting area with numbers 4 to 17 refer to the total of the numbers on the dice. On the other hand the Triples bet is won if all the three dice show the same number. The chip denomination is selected by operating the +/- buttons below the chip. Then the wager is placed by clicking on the appropriate betting areas. A player can place as many wagers as he wants subject to his having the requisite balance. The amount bet by the player is shown in the BET cell. After placing the wagers the player clicks the ROLL button to activate the dice. When the dice come to a stop, the winning betting areas are highlighted, whether a bet was placed on those areas or not. The amount won by the player is shown in the WIN cell and the player’s balance is automatically credited. If the player had enabled the "Keep bets on the table after each roll" then his bets will remain in the betting area. If he wants to continue playing with the same bets he just has to click the ROLL button again. If he wants to place different bets he can clear the betting area by clicking the CLEAR button and starting afresh. If the player had disabled the "Keep bets on the table after each roll" then only the winning bets will remain on the table. If the player wants to revert to his last bets then he has to click the REPEAT button. A comprehensive Help section has been provided by Microgaming. This can be accessed by clicking the ’?’ sign in the top left corner. Interested in reading more detailed information about Sic Bo? If so Click Here for more details.